A variation of the traditional Chicken Noodle, with gemelli shaped pasta in a rich chicken broth, celery, onions, carrots, and large pieces of tender white chicken meat. DIRECTIONS NOTE: Product MUST reach a minimum of 82°C (180°F) measured with a thermometer for 2 minutes by all cook methods given below. Stir before serving.KETTLE COOKER / STEAM TABLE: Gradually whisk contents of package in 4 litres water. Cover container. Set unit on HIGH and cook for 45 minutes. See NOTE above.STOVE TOP: In a suitable container, gradually whisk contents in 4 litres of water. Bring to a boil. Cover and simmer for 20 minutes. Stir occasionally. See NOTE above.KETTLE COOKER / STEAM TABLE: Gradually whisk contents of package in 4 litres water. Cover container. Set unit on HIGH and cook for 45 minutes. See NOTE above. Premium Soups that just happen to be dry, delivering the full bodied soup patrons expect. 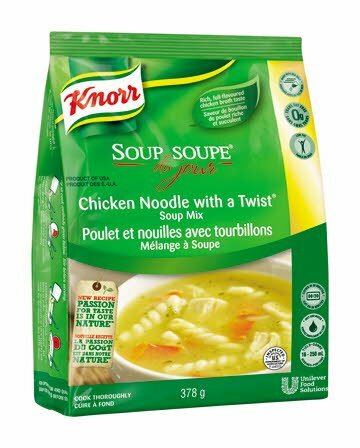 First time cook ingredients unleash the true aroma of the soup, and allow shape and texture integrity through the 4 hour hold time. No costly freezer space required. Just add water, whisk and heat in 30 minutes or less. Offering a variety of soups is easy with Soup du Jour, with simple yet versatile preparation and application. Great as a main dish entree or as an accompaniment to a salad or sandwich.